There are far too few true delights in this world, especially when living in Michigan in the middle of winter. Most things are dead, either outwardly or inwardly. Going gloveless to text a friend back could invite frostbite in minutes, and the threat of entire sunless weeks is omnipresent. Luckily, we’ve identified one of the handful of things that the cold preserves, rather than kills: ice! 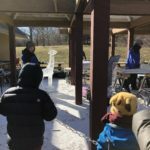 Beautiful, wooded County Farm Park was the perfect backdrop for a wintry festival, with a playground for kids, a pavillion for the artists, and a rec building for arts and crafts. 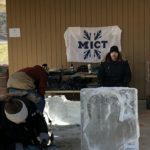 The ice carving teams from Washtenaw Community College, Macomb Community College, and the University of Michigan supplied the Ann Arbor area with a Saturday full of joy with their astounding skills. The sun even stayed out for the day, reflecting off the sculptures, glittering off smooth curves and edges. 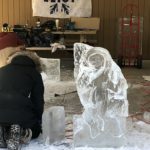 There seemed to be an animal theme: a giraffe, rabbit, and salamander emerged from three blocks of ice, while U of M also constructed a vintage-style camera. Michigan’s vintage-style camera in the works. Washtenaw’s multi-part sculpture in progress. 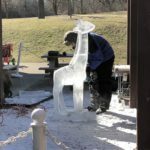 Constructed from several pieces melded together, Macomb’s giraffe stood four and a half feet tall. 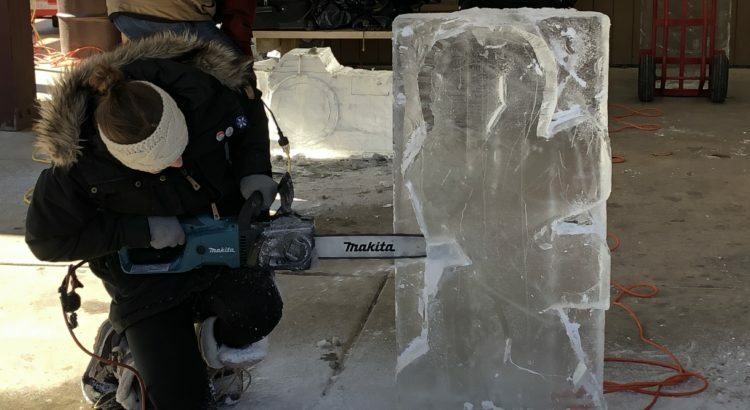 The carving process involved chainsaws, small drills, brushes, and other special tools. 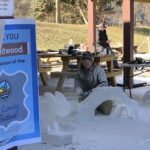 Michigan’s salamander working its way out of the block. In a lovely coincidence, Macomb’s sculpture matched a little boy’s giraffe hat, which was definitely the best part of the day. The audience was mostly families with small children, and the outdoor environment thankfully allowed for a great many adorable dogs to walk amongst the crowd. My girlfriend and I were probably the only childless adults to make pipecleaner snowflakes in the craft room, but we received no criticism, even when mine turned out looking like a deformed spiderweb. Children below the age of ten did appear to be the festival’s sole target audience, which felt like a bit of a mistake. In future years, they could decide to open it up to older children and childless adults, perhaps with a musical guest or a few local food trucks. 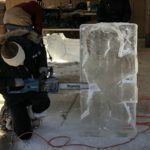 There could be a reception that goes later into the evening after the carvings are completed, adding in an element of colorful lights, during which the artists can explain their pieces and process. There is only so much an event with no admission fee can add in, but there is a variety of routes planners could take to expand the festival that involve little cost. 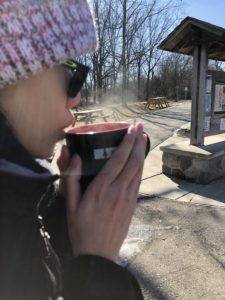 But the place they are at now is wonderful already; they had secured a sponsor (an living community with new apartment buildings opening nearby), which allowed them to serve hot chocolate and popcorn, as well as to supply several crafts. I am always thankful for free stuff. The sponsor gave out hot chocolate mugs to keep, which is a beautiful thing for any college kid (I, for instance, am the proud owner of exactly two $1 plastic plates from Target). Despite the cold, the day was made infinitely more joyful with a little sweetness, and some cool art.